This is one of the clearest, best laid out, accessible and well illustrated photo books I have yet seen as an eBook. The book is devoted to the use of the Nik imager processing software for black and white images. If you are serious about this you will acquire (or already have) this software. If you place the image processing on the left of your screen and open Whalley's book on the right-hand side (or on your Kindle (eReader)) next to you; you can go through the book whilst editing your own image. 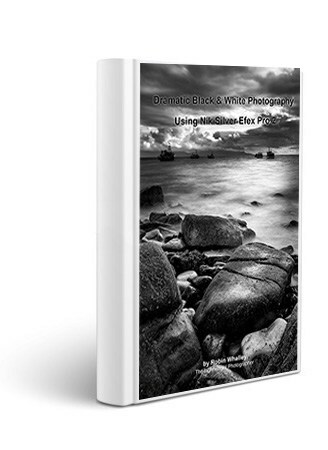 This book is a must for all photographers working in monochrome with this software. This book covers Nik Silver Efex Pro 2. Silver Efex Pro 2 has long been a favourite package with photographers who want to convert color images to black and white. Sure you can do this in Photoshop or Elements but the results really don't match what can be achieved with this software. When used properly Silver Efex Pro can reveal dramatic and stunning images concealed within what were previously lacklustre color photographs. The secret, as with most things in life is knowing how to do something properly. Do you know how all the sliders and conversion tools work and how to chose the best adjustments for each particular image? What order should you work through the adjustments so as to create the greatest impact? Does it matter? What processing should you apply to images before taking them into Silver Efex Pro? What is the difference between the Structure and Fine Structure Sliders and which could damage your image? Most of all, why do some black and white images work whilst others fall flat? If you want to answer these questions and more, this is the guide you have been looking for. It covers every aspect of the Silver Efex interface, explaining all the adjustment options. The effects of individual sliders are compared so that you are well placed to determine the best approach for converting any image. The first part of the considers a number of black and white images to identify any rules to help in creating dramatic conversions. Next is a thorough coverage of the software and all its capabilities. Finally there are three examples which detail the workflow and application of the Silver Efex tools. This final section is also supported by image files which can be downloaded from my web site, allowing you to follow along. You will find everything is presented clearly with sufficient detail to allow you to master this powerful package. I do not include filler material; I just want to convey the essential facts. Now if you are wondering about this length of this book I can tell you it is 111 pages in A4, contains 20,000 words and 99 illustrations. This is not a short pamphlet like so many other low priced guides. If you are still not sure, why not download and take a look at the sample. It will even give you the links to my web sites.